Pack of Twelve 3-panel face rest covers made from our most popular durable and comfortable poly-cotton interlock double knit jersey material that holds up to heavy use and regular laundering. 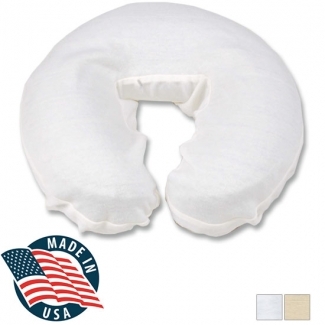 Fully elasticized to fit your cradle perfectly and snugly. Twelve 3-panel face rest covers made from our most popular premium 50/50 Poly-cotton jersey interlock double knit fabric that holds up to heavy use and regular laundering. Durable, economical, and fully elasticized to fit your cradle perfectly and snugly.